Soda drinkers nationwide just breathed a exasperated sigh of pleasure. It is definitely a good deal compared to their normal price for their drinks. Next to movie theaters and sporting events, fast food restaurants charge more for their soda than any other retailer. A large Coke will run you over 2 dollars with tax at a local McDonald's. Unfortunately, this is not the best deal in town by a long-shot. 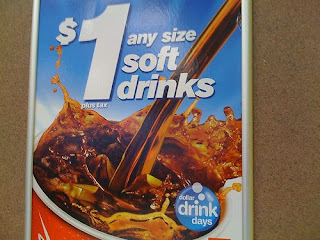 Just this morning, I passed about 4 or 5 gas stations advertising a 44 oz soda for 79 cents. Tell me you're seeing the same thing? McDonald's and the gas stations running this deal are smart little bastards. Let's say you only want a soda. You pull into the McDonald's for a large diet coke. In the drive-thru, you're bombarded with pictures of food that you've never seen at McDonald's. Oh, they may call it a Quarter Pounder with cheese, and you've bought one before, but it looked nothing like the picture. The picture shows a fluffy bun, burger hanging over the sides, and cheese perfectly melted. It's a picture that the Carl's Jr. advertisers would be love. The reality when you buy one, is that the paper is dripping grease on your pants, the (meat?) patty looks like it was thrown like a Frisbee onto the bun, and sauces and onions are spattered randomly on all sides of the burger. Instead of lunch, you get a quarter pounder with cheese grease bath. Suffice it to say, there is a 6% chance that you'll pull away from the McDonald's with only a drink. Odds are good that you'll be sporting a 6-piece nuggets, or a double chee. The gas stations aren't much better. Do you know where the soda machines are in the store? Try the back...the way back. They want you to pass every beef jerky, sunglasses rack, and energy drink display on the way to your 79 cent soda. Do you realize that a regular candy bar in a gas station was $1.09 on my last trip? To satisfy your Twix craving, you'll have to drop a couple bucks. Give me a break. There is a 14% chance you'll walk out with only a soda. Most likely, you'll have a pack of sixlets or pickle flavored sunflower seeds at your side. So, which is the lesser evil? I have your answer right here. At least in the gas station, you can regulate the soda/ice ratio. Germs can also be contained to a minimum. Beware of the "debit card button machine." This contraption alone carries 46 different species of harmful bacteria. Is the dollar drink at McDonald's worth the price? If you go here regularly, then it would be. Just be prepared to also drive away with a Big Mac and large fry at the same time. I suggest the Sonic half-price drinks between 2-4 pm every day. McDonald's dollar drinks slurp their way to a 2-star rating. Enjoy the nuggets!! Wonderful post.I have recently found an online TV Show with great episodes ling ahead to watched watch house online, episodes are very interesting. Wonderful comment.....for being a little spammy. I just wanna say fast food places actually have high standards of hygiene. i worked at one for a while and we actually had to wash our hands every 20 minutes with hot water and soap, apply hand sanitizer, and then put on gloves as well. in my experience, i have never seen any poor hygiene practice in the kitchen. if you have never worked in a fast food place, i would advise against bad mouthing the people who work hard to get your food to you in as little as a minute. @anonymous -- I realize that during your 2 week training period at Taco Bueno Baby, cleanliness was stressed. If you wouldn't have been fired shortly after your training for "making sweet love" to the pinto beans, you would have seen the true face of filth. I worked for 5 years in an upper class restaurant, and let's just say that you don't want to know what goes on behind the kitchen doors. Now give me extra hot sauce.